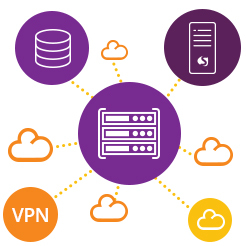 The Virtual Public Network or VPN is a network connection using a channel, often the Internet, between the public and private network (for example the internal network of a company). The key element of a VPN service is that the user can receive and send data from both the public and private network and at the same time you benefit from private network management, safety and enhanced functionality. We have created the VPN service especially for companies with offices in different locations (in the same country or abroad), but also to connect multiple networks for personal use. Through our VPN service, your data will quickly and safely arrive to your colleagues from other offices. Another benefit of the VPN technology is that it provides you access to websites that you normally follow, even when you are travelling. We all know that some websites are blocked in some countries or cities worldwide, but with a VPN, the access to your favourite websites is not affected by the area you are in.